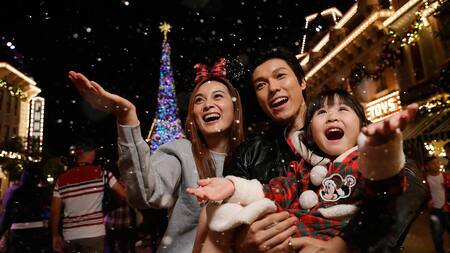 As the snow begins to fall this Christmas, Hong Kong Disneyland will be lit with a magical glow! 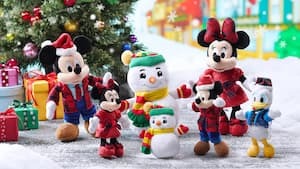 Mickey and Friends have put up their most beautiful holiday ornaments and dazzling lights, cooked up a savory Christmas feast, placed a twinkling star on the top of the tree, and filled the air with snow. They’ve prepared a magical winter wonderland, a place to create unforgettable memories that’ll set your heart aglow! But they’re missing one thing: You! 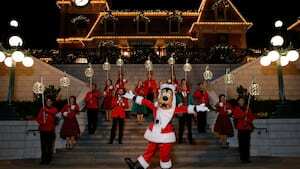 They need you to come and ignite the magic so that all the festivities can begin. 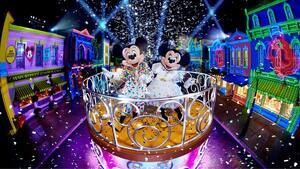 Come one, come all, and celebrate with Mickey and Friends this year at Hong Kong Disneyland, from November 15, 2018 to January 1, 2019. 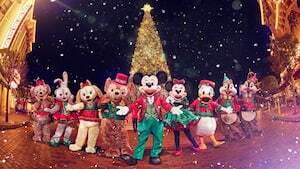 Mickey and Friends invite you to the fabulous Christmastime Ball, a yuletide musical extravaganza! Sing along to classic Christmas tunes with a live quartet of singers and follow along with our dancers, who make every movement jolly. 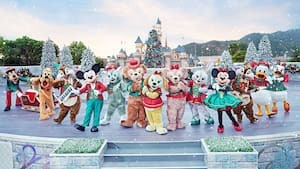 Then watch as your favorite Disney Characters take the stage — Mickey, Minnie, Donald, Daisy, Goofy, Pluto, Chip ‘n’ Dale, Duffy, ShellieMay, StellaLou and our NEW friend Cookie! What would Christmas be without a magical snowfall? 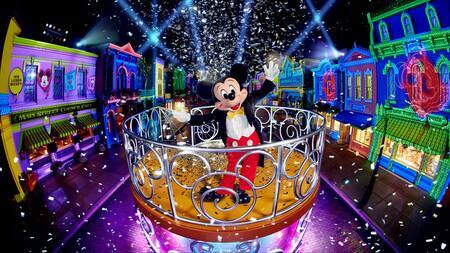 Watch with wonder as Mickey and Friends make a special wish: Let it snow! As dusk falls, everyone gathers together, making their wish … and, lo and behold, it starts to snow! But this year, it won’t just snow, it’ll glow! Revel in delight at the sight of a winter wonderland in Hong Kong that glows with thousands of beautiful lights. 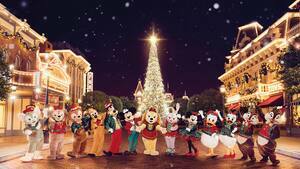 And feel the magic in the air as the Christmas spirit comes to life! Meet many of your favorite Disney Friends, plus one more! 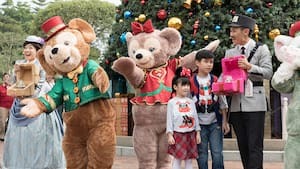 This year, Duffy introduces new friend, Cookie! Visit Mickey, Minnie, Donald, Daisy, Goofy, Pluto, Chip ‘n’ Dale, Duffy, ShellieMay, Gelatoni, StellaLou, and Cookie at different locations in Town Square and along Main Street, U.S.A. Take a photo or just say hello as Mickey and Friends are there to share their wishes with you and show off their festive holiday costumes. 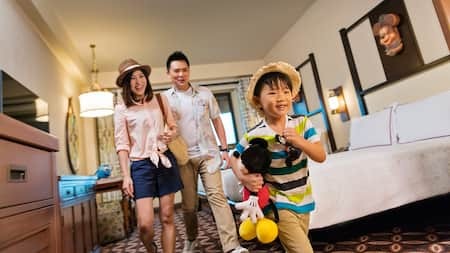 Treat yourself and your family to a festive stay at our three hotels – Hong Kong Disneyland Hotel, Disney’s Hollywood Hotel and the Disney Explorers Lodge. We’ve gone all out with our decorations this year and dressed all our hotels in our holiday best. Everywhere you go red, green, and golden shiny ornaments, Santa hats, and sprinklings of snow will fill your view. Bask in the Christmas ambience and get into the holiday spirit with fun activities throughout your entire stay! 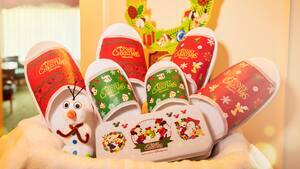 If you are tempted by all the savory scents in the air, why not stop for some Christmas treats? We’ve got desserts galore! From Log Cakes to Christmas Puddings, everyone’s sweet tooth will be satisfied. Yum! Bring home the Christmas joy with over 100 limited-edition Christmas themed goodies, from apparel to accessories, toys, and home décor! As you stroll along Main Street, U.S.A., wonder at all the store windows decorated with stunning displays. 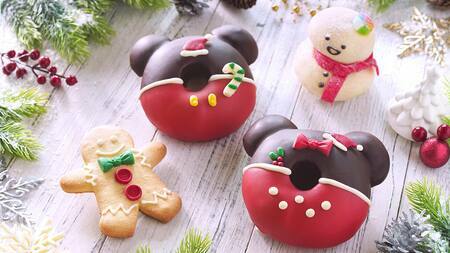 If you are tempted by all the savory scents in the air, why not stop for some Christmas treats? We’ve got desserts galore! From Log Cakes to Christmas Puddings, everyone’s sweet tooth will be satisfied. Yum! Or for something a little heartier have a merry feast and indulge yourself with our specially created dishes at our various park and hotel restaurants. See what our amazing chefs have whipped up in the kitchen this year. 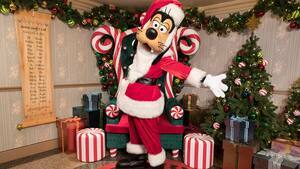 Hopefully you’ve been good this year because Santa Goofy will be greeting guests in The Annex. He’ll be sitting on his Christmas throne ready to hand out collectable postcards which you can mail to friends back home. 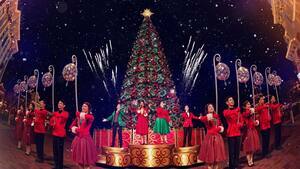 Be prepared to be dazzled by our spectacular “A Holiday Wish-Come-True” Tree Lighting Ceremony. On Main Street, U.S.A., Mickey and Friends have set up a magnificent tree to create a magical moment to remember. 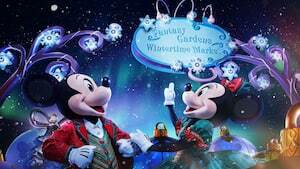 With a quartet of live singers, glowing lanterns, and a magical snowfall, the street will be transformed into an enchanting scene straight out of a holiday storybook. Share this special moment with your loved ones for a Christmas memory you’ll treasure forever. What better way to round off a perfect day of Christmas celebrations than with a heartwarming serenade? As you head out of the park after an evening of festive performances, Christmas Carolers in Town Square bid you goodnight with a delightful performance under the stars. It’s a magical way to end your experience. The magic continues all along Main Street, U.S.A. and the Train Station. Discover what your favorite Disney Friends are wishing for this Christmas, as they take part in a series of magical moments along Main Street, U.S.A. – happening every hour, so don’t worry about missing out on the fun as your favorite Disney Characters, the Disneyland Band, and the Main Street Townsfolk will be celebrating throughout the day! Every moment is filled with an enchanting Christmas glow. Come join the party as we honor the mouse that started it all! Minnie has thrown a special surprise – the “We Love Mickey!” Projection Show Birthday Edition. Watch as the buildings of Main Street, U.S.A. are lit with stunning visual displays of Mickey through the ages – past, present, and future. Don’t miss out on this limited-time-only birthday special for the World’s Biggest Mouse Party, from November 19, 2018 to February 24, 2019! Complete your perfect Disney vacation with a fun-filled day at the Park! 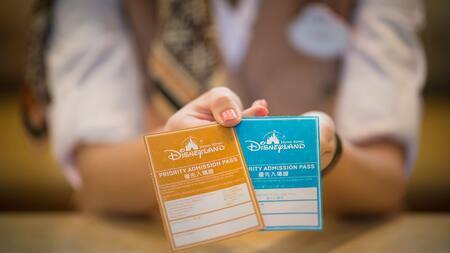 As our hotel guest, you will receive your Priority Admission Pass* for selected attractions, and gain convenient access to the Park with a Designated Park Entrance. 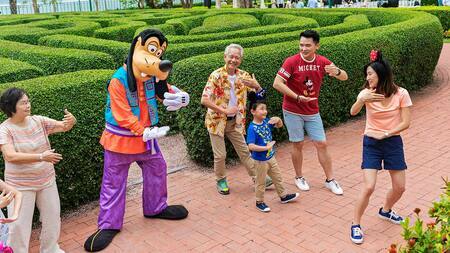 Join Goofy for a morning tai chi exercise at the Hong Kong Disneyland Hotel; or spend the time in the Studio Lounge in the company of Goofy for a Disney movie. Enjoy a photo moment together to remember the magical encounter! 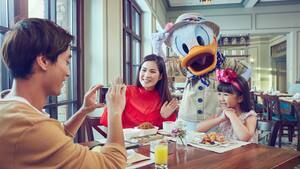 Guests staying at one of the resort’s three hotels can join fun activities throughout the day of all three hotels. *Subject to availability. Attractions may be suspended or closed without prior notice. A Priority Admission Pass will be given according to the number of guests in each room with a maximum of four passes per room. Enjoy limited offer and save up to 20%! 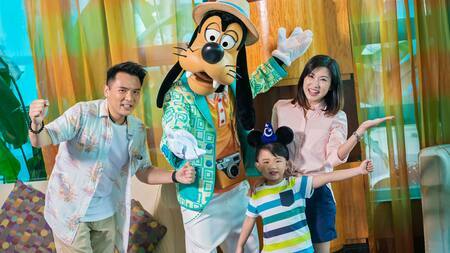 Book now and get ready for and unforgettable vacation with Disney Friends. Upgrade to 2-Day ticket with extra HK$80 and get HK$30 shopping coupon. Purchase online now!